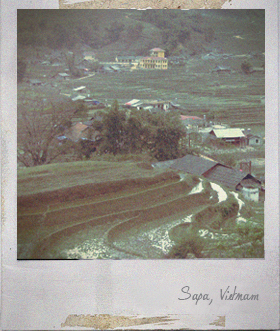 I was impressed by the beauty of Vietnamese women when I visited Vietnam. They don’t deck out in expensive outfits or heavy makeup, they just really have amazing natural beauty. I think the beauty is coming from their inner strength. They are honest and hardworking, always smily. Cut the white fish into 2 inch pieces. Mix all the marinade ingredients in a bowl, add the fish and coat well. Cover the bowl with cling film and refrigerate for about 2 hours. Heat some oil in a frying-pan, add the chopped peanuts and chopped spring onion and stir-fry for 1-2 minutes. Set aside. Remove the fish pieces from marinade, remove the excess marinade. Cook the fish under a preheated grill for about 3 minutes each side, or until cooked through. Place a potion of rice noodles into a bowl, sprinkle with the sautéed peanuts and spring onion, top with a portion of fish and garnish with some coriander leaves. 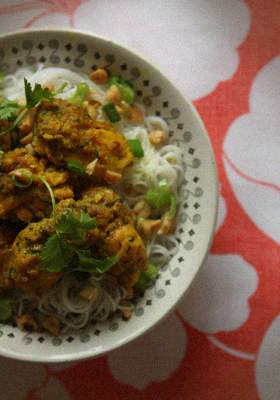 You are currently reading Vietnamese Style Turmeric & Dill Fish with Rice Noodles at Fish Trip Cafe.